Located in the heart of the trendy neighborhood of Williamsburg, this duplex apartment’s main challenges stemmed from a restrictive space layout, lack of storage and low quality of construction materials. 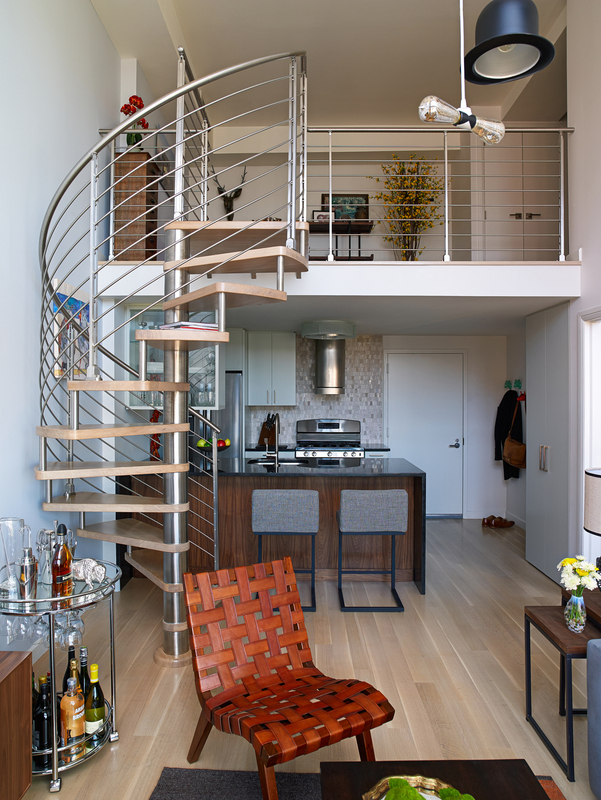 Taking full advantage of the double height ceilings, the vertical access to the mezzanine was relocated and a custom spiral stair was designed to better fit the flow between the living areas. The space previously occupied by the existing straight stair was utilized on both floors: expanding the bathroom and creating a full depth custom closet for the bedroom, also allowing to add storage on the upper floor. The Edgy chandelier was commissioned by the owners to represent their aesthetic and provide a central artistic feature inspired by fashion. Its controlled dimmers provide functional and ambient lighting.